This has been a matter of concern for me too and I guess everybody who’s a gadget freak. These days products are made with very less lifetime and that’s the reason I think companies release a new model too soon. So I just stopped bothering myself no matter how latest my friend’s gadget is. When I decide to buy something I see if it matches my requirements and go for it. That’s what matters and never should anyone go for price-drops coz they are like a bait, a drop in pirce always means they are using some cheap material which Ads don’t talk about. totlly love the x-axis on the plot. even funnier than the plot itself! ha ha ha.. extremely hilarious 2-d(as usual!!).. good one. .totally enjoyed the graph..
Yeah Radhika, I suppose that is the only way you avoid the markets fooling you! Thank you! I love it that you love it! Wow! That’s hi-tech, Reva! 😛 Do you work for the CIA? No wait, you have a sense of humor. You cannot be working for the CIA. I just got back from my vacation, and I know what you mean about all the crazy electronics that keep developing. Though sometimes its hard to not fall for some of things..a la the Ipod Touch. I love it. But now that I bought the Itouch, I do kinda wish I bought the Iphone instead. 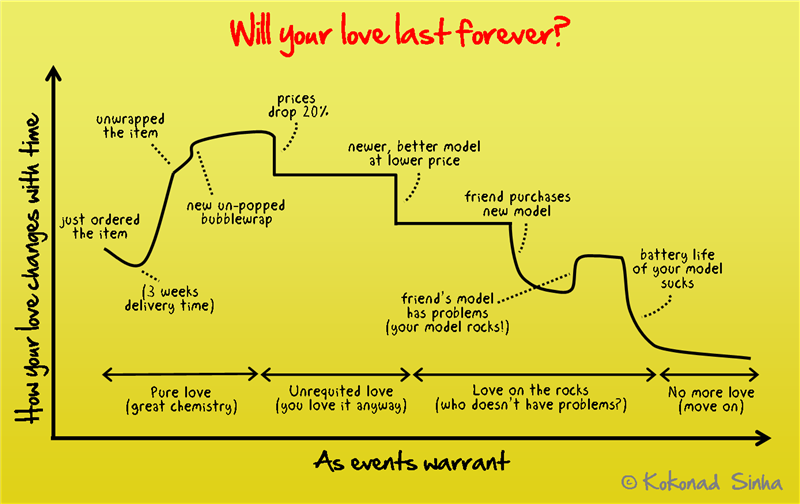 Haha, this is how the cycle works, each new gadget leads to the temptation of wanting another. Look who’s back! I am glad you liked the 2D! Yes, the love/relationship thing kind of panned out as I was creating it for electronics only. It was like a revelation of sorts! I know about the iPod touch – it’s wa-wa-awesome! I wish I had waited for Generation 2.0 before I bought it though. I could have done with an external volume control 😀 Nevertheless, it’s my favorite thing during meetings and seminars when I am get REALLY bored! Thank Steve Jobs for putting wi-fi on that thing! But what you said about the cycle is very accurate! Except that it’s not a cycle – you pretty much never get back to what you owned previously, cause they serve as paperweight! And you’re right, it’s not really a cycle, it’s your 2D, haha. I’m not too into techy things though, though I am a sucker for trendy technology – – but aren’t we all a little guilty of that? 😛 I can bet most people if they were given money to buy an mp3 player would opt for an iPod versus any other brand. Oh! How I hate this gadget (rat?) race. Why can’t stuff be simple. Instead of trying the kitchen sink approach? Like when mobile phones did nothing but calls and SMS (text messages). Or music players played music. I did love my first Walkman. Until it died. When taken in for service, the repair dude opened it and found a dead fly inside!!! I kid you not. His comment “bas kaise chalegi jab driver mar gaya” (EN: how can the bus run when the driver’s dead) was apt. And would you believe my family VCR went thru 4 head changes in 15 months. The service point couldn’t understand how quickly the object went kaput. Which was good for the wallet: replacements 3 & 4 were free. I didn’t share that the machine would run 18-20 hrs on weekends while en familie immersed themselves in movies and Beeb TV serials. We only stopped for when the VCR stopped due to over-heating.